Ventured down to Holdfast Bay on Wednesday where the lawn bowls 6 nations comp is taking place. Australia have been doing very well. Was a beautiful sunny Adelaide day. They are there till Sunday for anyone wanting to go support our Aussies. Youngest team member is 18 - oldest is around 45 I reckon. Great photo's A Mum. Only had a couple months off but I'm already getting the itch back, particulary after looking at these pics! Don't worry - the season will be upon us before we know it ! I now play bowls at Freeling Div3 great game. Well done Bundy. It is a great game, I'm only a young fella (32) in bowls terms but have been playing the game since I was 15. It's a stimulating and competitive game, but it also has a great social element that rivals any sport. I'd encourage anyone to give it ago regardless of age. 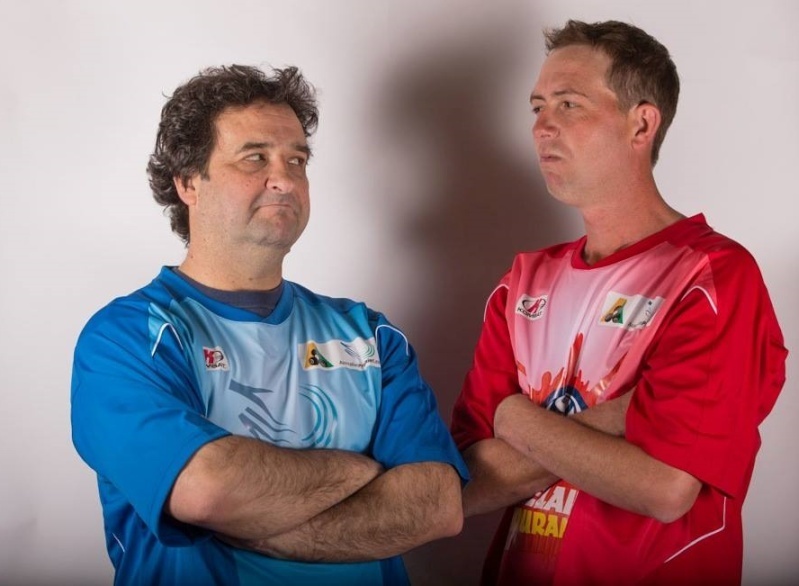 As the average age of the sides competing in the World Bowls Championships in Adelaide at the moment (under 30), it's not just a game for old people any more. Night Owls definitely sparked my interest. Even bought a Grange Dolphins shirt from my local, when I was back in SA. Yes, there is that element to the game also. 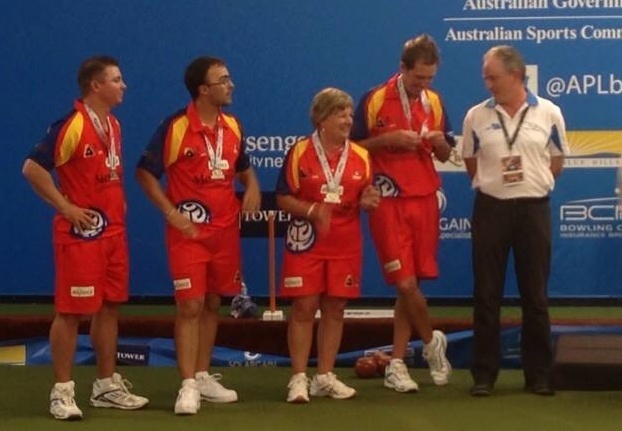 World bowls has just wrapped up hosted here in Adelaide. Unfortunately life's too busy for me at the moment to have gotten down there to support or take photos - but am stoked that our 'Jackaroos' did so well!! Australia claiming overall winners trophy. From 8 disciplines we managed to secured 5 gold and 2 silver. Not to mention a local SA lad was amongst the gold. Good to see we're finally making an impact on the national stage and that it's not all NSW & QLD. Good to see 3 South Aussies make the Australian Team for the 'Trans Tasman' heading to New Zealand in March. Lawn Bowls is venturing to something new and exciting! 19th November to 22nd November. 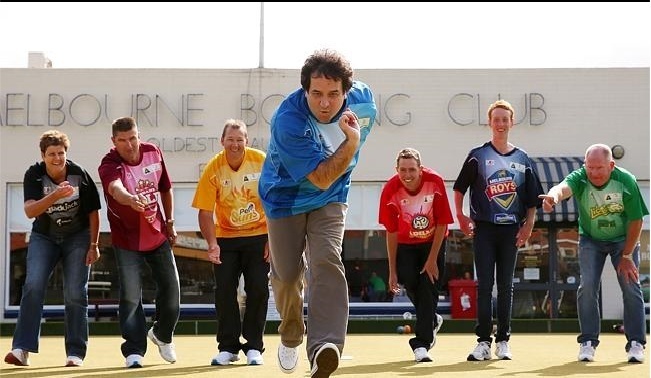 Of course the natural person to promote the game is Mick Molloy - who apparently jumped at the opportunity. The more I see the venue, the closer it gets, the more I wish I could be there in person! If the comp is a success and is run every year I can see myself timing a holiday with it at some point I reckon! How awesome does it look - I was hoping they'd actually 'share it around' Australia - however I don't think SA has a venue that can even live up to the ones in QLD/NSW. If we had just one venue like it in SA they'd make a killing. If you ever get the chance to GN - take a trip to Warilla. They host a lot of the 'on tv' stuff - the facilities include. Indoor green as well as outdoor greens. A couple of restaurants and a café. Situated on an ocean/river inlet. A couple of bars one including pokies. Oh and their own 'travel agent'. It's huge. And their prices are so reasonable - even cheaper than normal restaurants/shops etc. As I said if SA had something like this - that club would be very rich...lol. APL has been run and won - was fantastic!!! 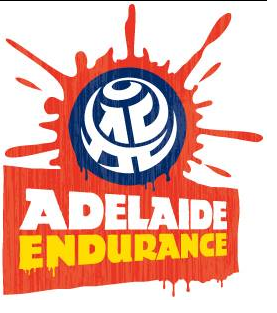 South Australia were one of only a couple of sides who went in with local home-grown talent. Majority of the other teams bought in high flying internationals or even talent from other states. These guys did us so proud. They did so well TE - ended up finishing 4th overall - but they won their fair share of games and were a force to be reckoned with... I think SA state teams at the moment are the best they've been in a long time. I would argue ever A Mum. We've never been a force on the national scene despite having a pretty good participation rate at grass roots level. Great to see us finally stack up well against the eastern states. For those bowlers out there - SA has it's own lawn bowls based show - which is hoped to spread Aust wide. was chatting to a guy at work today, who plays bowls for Modbury. gee there is some big money in the world of Lawn Bowls which certainly came as a shock to me. I was contemplating going out for night owls over the summer months and this has definitely peaked my interest now!! Wow I could be rich! My night owl boys down at Sema4 had our first win last week. Won the first 7 ends. We were in a daze. The week before we got the chocolates for the lowest score of the night. "1". A few more practices (beer sessions) and we could hit it big. Good viewing that! Great format the APL.